Policy and systems analyst with experience in the energy and national security domains. Ph.D. in Engineering & Public Policy. Posts and comments are personal opinions and do not represent government views. Thank Nathaniel for the Post! Not really. The cost of a wind turbine scales according to its mass, which scales according to the cube of the rotor diameter. But the energy available in the wind scales according to the square of the rotor diameter. Thus the gains in capacity factor from a larger turbine must be balanced against the losses in cost per rated capacity. This results in a “sweet spot” for turbine size at which costs are optimized, and right now we have hit that sweet spot in the 1.5 to 3 MW range, depending on locatlon. This explains why the cost of wind bottomed out in about 2003-2004 and has been moving sideways since. The upshot is that further reductions in wind cost will be marginal. The physics of wind is well understood already, and the designs are mature. The next thing to consider is that the goal is not “more wind”. The real goal is “less fossil”, and governments at all levels would do better to aim toward the correct goal. Thus, instead of the current RPS strategy, emissions would be reduced faster and deeper with an FPS (Fossil Portfolio Standard), in which fossil generation is capped, and the cap comes down over time. Utilities could then determine for themselves the best, easiest, cheapest way to get under that lowering cap. The solution that emerges might be wind, solar, hydro, nuclear, or (most likely) a mix of all of those. It’s almost certain that industries improve with experience, but grid-connected wind power is part and parcel of the grid as a whole and it is the overall performance which crucial. Argonne studied the issue and found rapidly decreasing benefits as the penetration of wind increased due to increased emissions from other plant starts and lower operating efficiency as they ran closer to idling power. If this is not taken into account, we will have the paradoxical outcome of a large penetration of renewables but a much smaller cut in fuel consumption, and still be paying the bills for all of it. Nathaniel, blaming any of the deaths of the wind industry on flawed government policy is an interesting way to cast history, a bit like saying, “physics killed the promise of man-powered flight.” More accurately, they can be blamed on a lack of steady, reliable wind. The fact that the U.S. gets 5% of its energy relatively cheaply and cleanly from wind is a wonderful accomplishment. Will it ever replace fossil energy, or provide enough energy to reliably power the country or the world? Never. Wind activists like to claim it displaces 5% of the country’s fossil fuel emissions, but that viewpoint is coming from a similar position skewed by entitlement. Inflated promises for both wind and solar are largely responsible for replacing carbon-free nuclear with gas-fired generation, and nuclear does indeed have the potential to eliminate most of mankind’s surplus carbon emissions. So wind’s contribution to low-carbon energy is probably a wash, and its ultimate effect on climate will be increasingly deleterious until the public becomes aware of its limits, accepts the fact that Fukushima-strength Japanese earthquakes really do only happen once per millennium, and learns to overcome its fear of the nuclear boogeyman. Or the next time one of those earthquakes rolls around, there won’t be any people left on earth to worry about it. Thanks for your comment. I’m not blind to the issues caused by renewables on the grid, and this post was aimed more at showing the importance of careful alignment of policy details with energy innovation goals using the history of wind as an example, than at advocating for wind as the answer to a lower-carbon electricity supply. In the interest of portraying an accurate picture, however, the authors of the paper you cite ultimately conclude that “additional emissions from increased start-up and cycling effects are much smaller than the reduction in emissions due to displacement of fossil-fired generation” and that “despite the increase in unit start-ups and cycling, the total amounts of CO2, CH4, CO, PM, NOx, and SOx emitted by thermal power units clearly decrease as the installed wind power capacity increases due to the overall displacement of fossil fuels.” That is, while renewables don’t achieve 100% of their theoretical carbon displacement due to the emissions from thermal backups, the net result is still a substantial reduction in CO2 and other pollutants (at least up to 40% penetration, the highest level they modeled). It’s pretty hard to cast this result as being adverse to further deployment of renewables. Thanks very much for adding to the discussion, Keith, and I’m generally in agreement. For the most part, further innovations and associated cost reductions in turbine technology are likely to be incremental in nature. Our point is that—partially in response to the RPS policies signaling a long-term commitment to make renewable generation a nontrivial part of the electricity mix going forward—innovations occurred, turbines got bigger, and costs came down. We couldn’t hit the 3 MW “sweet spot” in a mass-produced turbine when we tried in the 1980s, but we got there in the 2000s as both deployment and innovation were spurred by better-aligned policies. It’s also worth noting that the economics of offshore turbines are different from land-based turbines: balance-of-plant costs constitute a much greater proportion of the capital outlay (see Fig. 4 here), so the square-cube law you cite is not as strong a driver of optimum turbine size. Vestas and Siemens, at least, think a bigger size is optimal for offshore plants. Regarding goals, as you note, choosing correctly is absolutely critical. California’s 1980s policy had the implicit goal of “more turbines,” when a goal of “more wind generation” would have perhaps led to a better experience. The goal behind the RPS is, in most cases, not “more wind” but rather “more renewables,” and it just so happens that wind has been—by far—the largest beneficiary exactly because it has been the “best, easiest, cheapest way” to meet RPS requirements. Is “more renewables” the right goal? In an ideal world in which we could implement the most efficient and effective policy available, possibly not. The idea of a broader portfolio standard (e.g., a Carbon Portfolio Standard) has certainly been lobbied for, and DOE’s “all of the above” research strategy is an implicit agreement that we’ll need a to pursue a mix of technologies to get where we want to go. I see a lot of advantages in a sufficiently stringent, national CPS/FPS, and I’d be happy to see one implemented. However, I also think that carve-outs or special incentives for specific technologies aren’t necessarily a bad thing—they help spur earlier investment in high-risk areas that could provide great benefit in the future, even if they aren’t economically feasible today. Going all-in on “best, easiest, cheapest” (if we’re being honest, the focus likely will be on the latter two) today might prevent us from laying the foundation for what’s best, easiest, and cheapest in the future. As I advocated in the post, I think good policy strikes a balance between incentivizing deployment of the best present-day technology and encouraging innovation in next-generation tech. I’m aware that they wrote that. Their full text is behind a paywall, but I analyzed the summary graph that they put in the abstract and found that their own data says their conclusion only holds for small fractions of wind generation. the net result is still a substantial reduction in CO2 and other pollutants (at least up to 40% penetration, the highest level they modeled). Data points pulled from their graph show that their own data says that the displacement of fossil fuels has fallen by more than half (53%) between the 30% and 40% penetration figures. Drawing a straight line between the 30% and 40% points only gets you to 60-odd percent reduction even at generation of 100% of net consumption, and there is no way that that curve would fail to continue to flatten its slope toward horizontal. It’s pretty hard to cast this result as being adverse to further deployment of renewables. On the contrary, it is an extremely adverse result to more than marginal penetration. 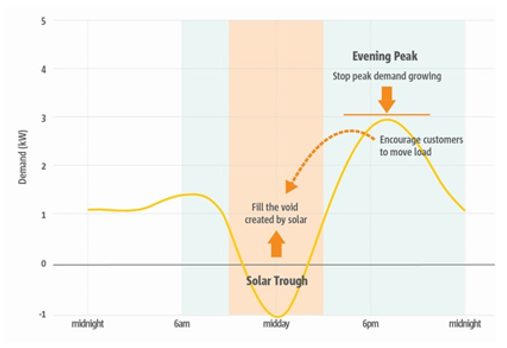 At some point you need to put the erratic renewables at the end of the dispatch order or remove them entirely, because they must play second fiddle to carbon-free base load that requires neither storage nor carbon-emitting backup. I’m not arguing for anything approaching 100% wind penetration, or that wind would be a preferable substitute for a carbon-free base load. But just as you wouldn’t want someone exaggerating the risks of nuclear technology, let’s not mischaracterize the size of the emissions reduction benefit found in the paper. The authors’ table of results (which your extraction from their graph roughly matches) shows a 28% net reduction in CO2 at 30% penetration. That 2 percentage-point take-back by gas backup doesn’t seem like big enough of a penalty to dismiss wind’s potential for significant carbon reductions beyond what is currently deployed. To characterize 30% penetration as a “small fraction” of generation and a “marginal” increase over current levels is a severe understatement, to say the least. We’ve got some headroom for more wind before diminishing returns take too big of a bite out of avoided emissions. The authors’ table of results (which your extraction from their graph roughly matches) shows a 28% net reduction in CO2 at 30% penetration. But there’s only a 7% drop between 20% and 30% penetration; 30% of the benefit is already gone at about the 25% mark. Between 30% and 40%, emissions only decrease by 4.7%; 53% of the benefit has vanished by the 35% mark. In other words, the cost of emissions reduction has increased by more than 110%. And I’m sure there’s an error in the data used to make the graph; it is incredible that a 10% penetration of wind could lower emissions by 11% or more. If we’re going to credit wind for cutting carbon emissions, those benefits must be measured at the exhaust stack, not the circuit breaker. If generator N generates less than half the benefits of generator 1, incentives for its construction should be scaled down proportionally (or not given at all). If the cost/benefit ratio has fallen so far, it means that further efforts should go into other options. I have taken different lessons from the history of the wind power industry. The 1980 debut of the Boeing MOD-2 wind turbine, with its 2.5 MWatt peak output being very near the sweet spot for today’s wind turbines, shows that the fundementals of wind power and the scaling rules were all known back then. The MOD-2 had most of the important features of modern units: horizontal rotor axis, blades “upwind” of the tower, tubular steel tower, computer controlled nacel yaw steering, computer controlled blade pitch (although only the tip angles were controlled). The main improvements in modern turbines over the MOD-2’s include the two steel blades being replaced with three fiber glass blades, and the fixed-speed AC synchronous generator being replaced with variable speed generators (double-fed induction and permanent magnet designs) which allows efficient operation over a wider range of wind conditions. The MOD-2 were not too complex, in fact modern machines are more complex. I would argue that the reason the MOD-2 was a commercial failure was that neither the government nor the investment community was willing to fund the design of this class of machines to true maturity, in order to bring down the “stubbornly high” cost. As I recall, the modern wind industry was born in the US in the 1980s, but we dropped the ball, and didn’t resume until the Europeans had already proven the technology could be viable. As figure 3 above shows, the boom in US wind power patents started around 2001, which is the first year the US wind industry installed more than a GWatt of new turbines (they actually hit 1.7 GWatts according to the AWEA). With the multi-billion dollar revenue stream that resulted, the wind industry finally had adequate cash to put into product development. So it’s really production volume and industry revenue that drive down cost, spur competition, and produce a more desirable product. Given the low recent production volumes in the nuclear industry, it’s clear nuclear holds great promise for cost reductions. If we are able to develop a regulatory environment that is more friendly towards incremental improvements and if we can maintain a steadily growing installation rate, then nuclear power should see the same cost reductions due to volume scaling as wind power. (So I agree that consistent multi-year policy support is needed). A final note on the replacement of 1930s era wind-powered water pumps with electric pumps: that just goes to show that the market can be quick to replace technology that is not well suited to the task. Innovation policy design is at the very heart of the problem. Governments’ faith in a faulty market (subsidy) model destroys disruptive innovation, because it’s uncommercial! It always will be – the ROI is too uncertain and too distant. New technology must be ‘proven’ to have a good business case or nobody puts up the money – Catch 22. Japan is way ahead of everyone else in patents for one simple reason. An application can be left unexamined for seven years, which saves that expense when you can least afford it. If more highly skilled engineers than I were to research the holistic solution (before-generator energy storage), I’m sure they would find that 3MW of new technology would out-perform a 7MW nameplate conventional wind turbine, but who is going to pay for the R&D? It certainly won’t be the incumbent industries as it’s not in their interests and subsidies are paid for electricity from the products they currently produce. I think they’d object to the state subsidy of innovation that’ll put them out of business! Who will be merry this Christmas? Recent history proves that, off-shore, the “real-world viability” of the HAWT design convention is very much in question. The cancellation of UK windfarms – the Atlantic, Celtic and Argyll Arrays (total cost circa $22bn. ), to name but three – is mainly due to the cost of installation of the wrong technology on the sea bed in 30m+ depths. In stark contrast, the political redefinition of electricity infrastructure as – erm – infrastructure, could redirect, say, £50bn of taxpayers money from HS2 into sustainable, dispatchable power, to boost the whole economy for everyone’s benefit. There isn’t a functional ‘market’ in innovation (patent = monopoly), so when a government commits to a so-called ‘market’ solution it can kill off new technology.